President Donald Trump speaks at the American Farm Bureau Federation convention in New Orleans, Jan. 14, 2019. With the partial shutdown of the U.S. federal government now in its fourth week, President Donald Trump continues to hold out the possibility that he will declare a national emergency along the southern border with Mexico. Trump could use the declaration to fund his long sought border wall, but Democrats in Congress firmly oppose the barrier, and even some Republicans object to the idea, calling it an overreach of executive authority. "I have the absolute legal right to call it," Trump told reporters Monday at the White House. "But I am not looking to do that because this is too simple. The Democrats should say we want border security. We have to build a wall, otherwise you can't have border security, and we should get on with our lives." Trump seemed to back away a bit from the emergency route Monday, especially after he told reporters last week that he might issue a declaration if congressional negotiations reached a dead end. "If this does not work out, probably I will do it. I would say almost definitely." ​Some Republicans say that point may be fast approaching. 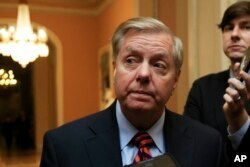 "It seems to me the only way left is for him to exercise that authority," said Republican Senator Lindsey Graham. "I don't see any action in the Congress." On Sunday, Graham suggested on TV that Trump reopen the government for three weeks to allow border negotiations to continue. The president rejected that idea Monday. Democrats oppose the emergency declaration, including Maryland Congressman Anthony Brown. "The use of these authorities, like the deployment of our troops to the border, is irresponsible, unnecessary and misguided," Brown said in a speech on the House floor last week. "Mr. Speaker, we don't have a crisis on the border. We have a crisis in the Oval Office." Trump is meeting resistance not just from Democrats but from some Republicans. Politico reported that members of the House Freedom Caucus have been urging Trump not to issue a declaration, fearful that future Democratic presidents could cite the move as precedent to declare an emergency on climate change or some other policy priority. Presidents have frequently declared national emergencies since Congress passed the National Emergencies Act in 1976. Analysts say that generally speaking, presidents have a lot of leeway when it comes to deciding what constitutes such an emergency. "The president has fairly broad power to declare a national emergency," said Brookings Institution scholar John Hudak. "According to a pretty firm reading of that law, it is hard to see where there is an exception to the president's ability to do it." Hudak says there are constitutional limits on the president's power, either through Congress or the courts. "Presidents have tried to go around Congress in terms of spending money in the past," noted Hudak. "And frequently presidents are stopped because the spending power in the Constitution rests with the Congress." 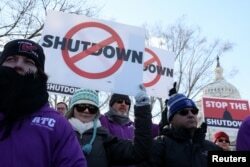 Federal air traffic controller union members protest the partial U.S. federal government shutdown in a rally at the U.S. Capitol in Washington, U.S. Jan. 10, 2019. Several recent polls show the public is blaming Trump for the impasse more than congressional Democrats. A new Quinnipiac poll on Monday found that 56 percent hold Trump and Republicans responsible for the shutdown, compared to 36 percent who blame Democrats. That survey is similar to others by CNN, The Washington Post/ABC News and CBS News, which all reported that voters blamed Trump more than Democrats by significant margins. Trump remains focused on his political base and may be encouraged by surveys that show Republicans generally standing with him on the shutdown. "This is not going to end until at least parts of Trump's base agree to go along, or say, Well, you tried your best and those darn Democrats just won't give in,'" said University of Virginia political scientist Larry Sabato, via Skype. But focusing on his political base does carry risks for the president, said Hudak. "President Trump is playing to his base here. But unfortunately, his base is a small percentage of the population and most of the rest of the population is not with him on this issue of the wall." Monday's Quinnipiac poll found that voters oppose a wall along the Mexico border by a margin of 55 percent to 43 percent. Other recent surveys also show more Americans oppose a wall than support it, although some polls have shown a slight bump in support for the wall of late. Quinnipiac also found that 65 percent of those surveyed in the latest poll oppose Trump using executive powers to build the wall, while 32 percent support it. Trump is hoping that his unwavering commitment to building the wall will shore up support from his base for his re-election bid next year. Many analysts, however, caution that his singular focus on delivering a wall for his supporters appears to be doing little to expand his base of support and may have contributed to a weakening of his public approval numbers in recent weeks.